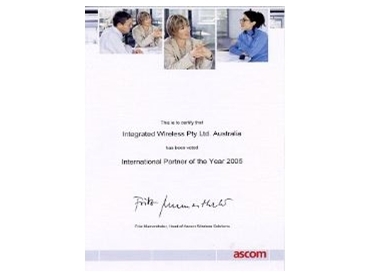 Integrated Wireless has just been announced as Ascom's 2005 International Reseller of the Year during the recent 2006 sales kick-off held at the Cypress Lakes resort in Hunter Valley. "Its a great honour to receive this award as it proves our focussed approach toward delivering integrated applications to the healthcare and industrial sectors is 100% correct and winning us significant market share" says Feargal O'Farrell - Sales and Marketing Director. "With this approach our clients get the best possible solutions in personal security (duress) and messaging (paging) because with our internal software development team we tightly integrate the Ascom hardware with the clients existing vital support systems - instead of trying to use unwieldy off the shelf overseas developed applications". will deliver all of the features available today on Ascom's DECT and RF based systems, but on industry standard 802.11 b/g WLANs. This is a perfect solution for those clients who are well advanced in their roll-out of wired IP Telephony and are wishing to implement ruggedised WLAN based voice, messaging and duress applications. international reseller by bringing the undeniable business benefits of our integrated solutions to all our clients in 2006". Integrated Wireless has 30 people focussed on delivering ruggedised wireless solutions to the Healthcare, Manufacturing, Corrective, Retail and Hospitality industries. With over 1,000 clients using a wide variety of our campus based wireless voice communications, messaging (including paging) and personal security (duress) systems; Integrated Wireless is a major force in the wireless applications market. By combining the exclusive distribution rights of Ascom Wireless with our rapid applications development capability, Integrated Wireless can deliver innovative applications that integrate tightly with our clients vital support systems. With a clear and well defined path into Wireless IP Telephony (VoWiFi), Integrated Wireless can offer converged solutions that guarantee no compromise on ruggedisation and functionality.